These racks slope downwards to place the displayed products at a perfect viewing angle. 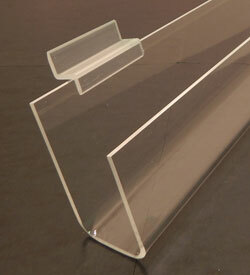 The solid construction increases the durability of this acrylic rack. 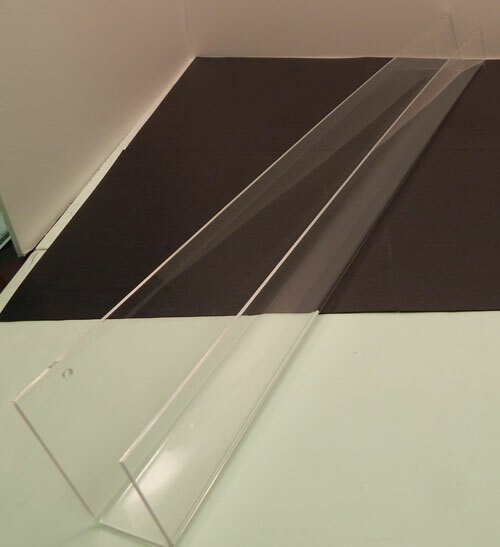 This acrylic rack is ideal for displaying greeting cards, books, videos and other types of media. 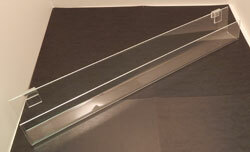 The clear acrylic design blends well with any pre-existing decor. The flame polished edges give a great professional finish. The interior depth of the greeting card rack is 1.5". The back wall is 3.25". The front lip is 2.5". The bottom of this card rack slopes down toward the front so the cards naturally tilt back. The back wall of the gretting card rack, although 3.25" high actually sits a little higher. The 4' version will be slightly bowed. This happens when heating, bending, and cooling long pieces of acrylic - The longer the piece, the more pronounced the bowing. If you would like to avoid the slight bowing, please order shorter lengths. Doubling up legths of the 2' pieces is probably the best option.